The eventual national champion turned out to be ninth-ranked Kentucky, giving coach Adolph Rupp four NCAA titles. The Wildcats reached the Final Four in Louisville, then proceeded to slip past Temple, 61–60, in the semifinals and beat Elgin Baylor and Seattle by 12 for the championship. The 1958 NCAA Men's Division I Basketball Tournament involved 24 schools playing in single-elimination play to determine the national champion of men's NCAA Division I college basketball in the United States. It began on March 11, 1958, and ended with the championship game on March 22 in Louisville, Kentucky. A total of 28 games were played, including a third place game in each region and a national third place game. Kentucky, coached by Adolph Rupp, won the national title with a 84-72 victory in the final game over Seattle, coached by John Castellani. 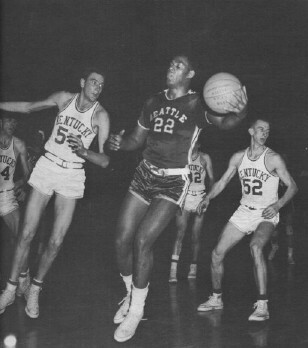 Elgin Baylor of Seattle was named the tournament's Most Outstanding Player. Part of the glory of that history is honoring and remembering it, something Kentucky has done a great deal in recent years. That is why Saturday will be a special day in Rupp as the 1958 Championship team will be in attendance for the exhibition game against Seattle. The UK administration made a great decision in bringing Seattle (now Division II, but moving up) to Rupp for the occasion and the 1958 team will be there to be honored both before and after the game. The “Fiddling Five”, named by Rupp because he thought their style of play was more like a fiddler than a violinist, even though they would be playing a “Carnegie Hall” schedule, are icons of Kentucky basketball history and have a special place in the heart of older Kentucky fans.